Definition at line 376 of file lltransfermanager.h. Definition at line 427 of file lltransfermanager.h. Definition at line 426 of file lltransfermanager.h. Definition at line 1175 of file lltransfermanager.cpp. Definition at line 1188 of file lltransfermanager.cpp. Definition at line 1204 of file lltransfermanager.cpp. References LLMessageSystem::addS32(), LLMessageSystem::addUUID(), completionCallback(), LLTransferTargetChannel::getChannelType(), LLTransferTargetChannel::getHost(), getID(), gMessageSystem, llendl, llinfos, LLTS_ABORT, mChannelp, LLMessageSystem::newMessage(), LLMessageSystem::nextBlock(), and LLMessageSystem::sendReliable(). Referenced by LLTransferManager::processTransferAbort(), LLTransferManager::processTransferInfo(), and LLTransferManager::processTransferPacket(). Definition at line 1217 of file lltransfermanager.cpp. References llendl, llerrs, and mDelayedPacketMap. 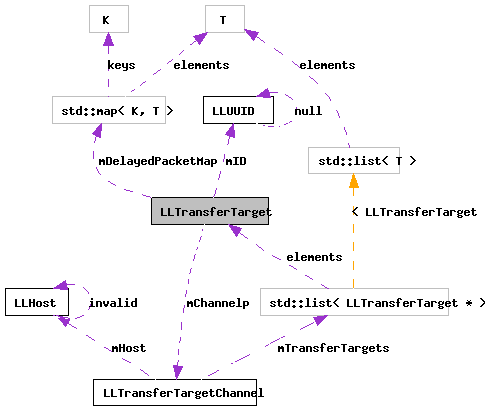 Implemented in LLTransferTargetFile, and LLTransferTargetVFile. Referenced by abortTransfer(), LLTransferManager::processTransferInfo(), and LLTransferManager::processTransferPacket(). Definition at line 1248 of file lltransfermanager.cpp. References llendl, LLTTT_FILE, LLTTT_VFILE, llwarns, and NULL. Referenced by LLTransferManager::processTransferInfo(), and LLTransferManager::processTransferPacket(). Definition at line 388 of file lltransfermanager.h. Definition at line 386 of file lltransfermanager.h. Referenced by abortTransfer(), and LLTransferTargetChannel::sendTransferRequest(). Definition at line 413 of file lltransfermanager.h. Definition at line 389 of file lltransfermanager.h. Definition at line 387 of file lltransfermanager.h. Definition at line 417 of file lltransfermanager.h. Definition at line 416 of file lltransfermanager.h. Definition at line 414 of file lltransfermanager.h. Definition at line 415 of file lltransfermanager.h. Definition at line 398 of file lltransfermanager.h. Definition at line 399 of file lltransfermanager.h. Definition at line 432 of file lltransfermanager.h. Referenced by abortTransfer(), LLTransferTargetChannel::addTransferTarget(), and getChannel(). Definition at line 437 of file lltransfermanager.h. Referenced by addDelayedPacket(), LLTransferManager::processTransferInfo(), LLTransferManager::processTransferPacket(), and ~LLTransferTarget(). Definition at line 433 of file lltransfermanager.h. Referenced by gotInfo(), and setGotInfo(). Definition at line 431 of file lltransfermanager.h. Definition at line 435 of file lltransfermanager.h. Referenced by getNextPacketID(), and setLastPacketID(). Definition at line 434 of file lltransfermanager.h. Referenced by LLTransferTargetVFile::dataCallback(), and setSize(). Definition at line 430 of file lltransfermanager.h. Referenced by getSourceType(), and LLTransferTargetVFile::unpackParams(). Definition at line 429 of file lltransfermanager.h. Referenced by LLTransferTargetVFile::applyParams(), LLTransferTargetFile::applyParams(), and getType().